RC Models are good for single axis measurements as well as for measurements to object moving past the sensor. These are reflective type transducers based upon detecting the intensity of reflected light. RC Model sensors have a pair of fibreoptic detectors in the sensor tip. Light reflected off a target follows two separate paths back to the electronics where a ratiometric calcuation provides the distance measurement which is independent of varying surface reflectance i.e. reflectance compensated. 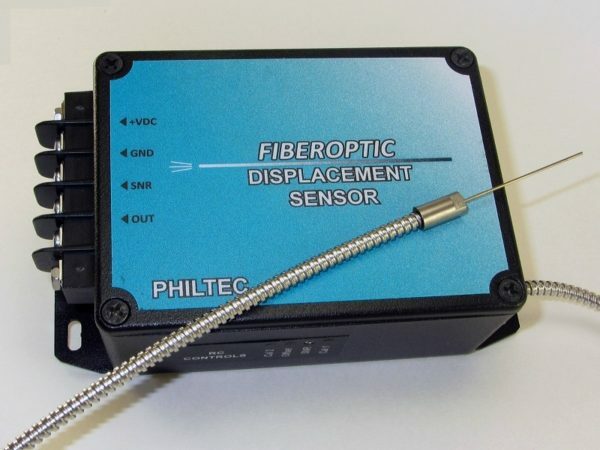 The RC type fibre optic sensors are a family of very high performance non-contact displacement sensors. With resolutions, down to 0.01µm and measuring ranges from 50µm to 2.5mm and a 200KHz + frequency capability. Their rugged construction and compact size means they are suitable for measurements inside of mechanisms, submerged in fluids and hostile environments. The sensors can measure to any surface that reflects light even if the surface reflectivity changes. The sensors are suitable for applications where the target is moving past the sensor such as a rotating shaft or moving sheet. The standard sensor package provides a stainless steel sensor tip, a 3 foot long fiberoptic cable sheathed with PVC over steel monocoil and DC-20kHz bandwidth amplifier or DMS signal processing unit as one integral unit with the fiberoptic cable potted into the electonic enclosure. Many options are available whereby the sensor tip, fiberoptic cable and/or the sensor electronics can be customised. Several options can be combined into one unit, but note – it should be realised that certain combinations of options are not achievable for all models. 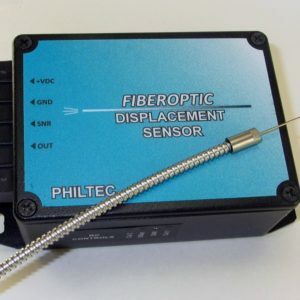 For example, it is not reasonable to expect to achieve high frequency response when combining replaceable tips with long fiberoptic cables and dark targets. Please contact us for clarification on allowable configurations. H3 No Provides RC models with a high bandwidth amplifier, DC – 200kHz. Bandwidths up to 350kHz can be specified.